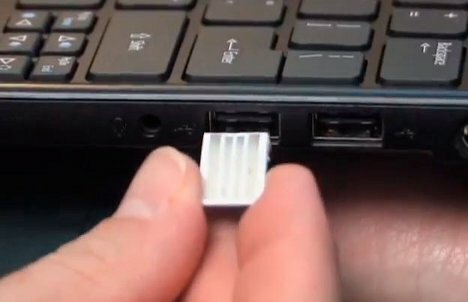 USB drives were a pretty amazing technology when they first started popping up, but now they’re so common that we hardly notice them anymore. The intelliPaper USB Drive could be the coolest advance in USB drive technology in a very long time. A start-up called intelliPaper is making writable USB drives out of paper and embedding them in greeting cards, sticky notes, and 3 X 5 notecards. The drives aren’t entirely paper, of course – there is a silicon memory chip involved. But the paper drives feel just like regular paper, with no discernible bumps or added weight. 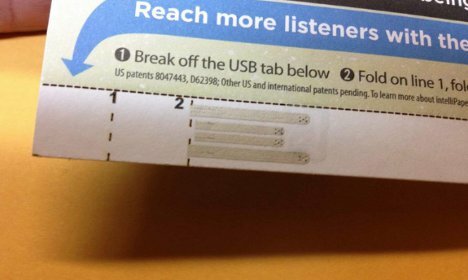 The paper USB drives can be sent through the mail just like regular paper. The memory capacity ranges from 8 MB to 32 MB, so they can hold a few small files for business communication or maybe some photos to send to family members. On the sender’s side, a small reader/programmer gadget and software are needed to get the files onto the paper USB drives. But once the drives reach their destination, they can be inserted into a regular USB slot in a computer. And once the recipient is finished with the files, the intelliPaper drive can easily be thrown away. There are almost endless possibilities for a lightweight, low cost, disposable memory device. Newspapers and magazines could embed bonus content that would be instantly playable via near field communication devices (like most smartphones and tablets). Business cards could show off not only a person’s name and number, but an entire portfolio. The ideas really are exciting – and if you agree, you can get in on the project at IndieGoGo. See more in Digital Design or under Technology. December, 2012.